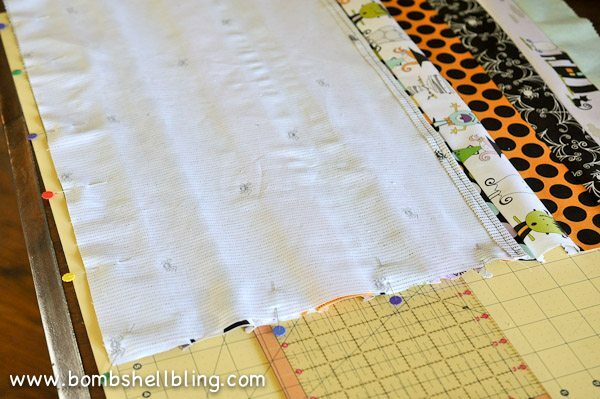 I was honored and thrilled to post this tutorial for the Cutting Corners blog earlier in the week for one of my very favorite fabric companies, Riley Blake! 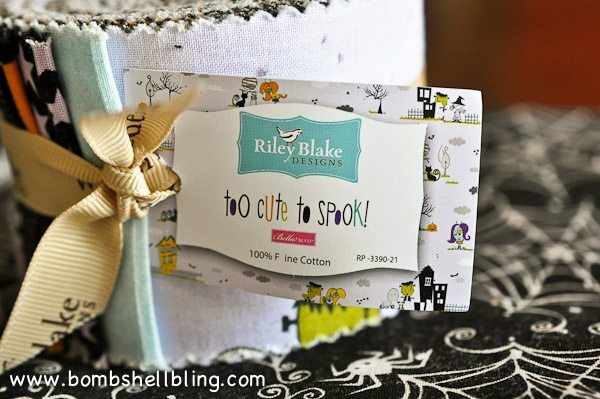 Riley Blake makes the most ADORABLE fabric! I love it all! 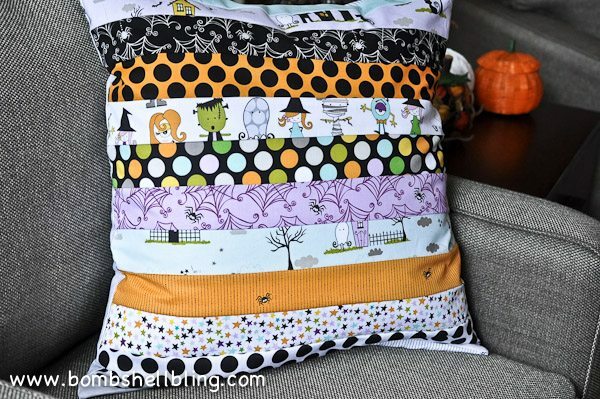 When I found out I was going to have the opportunity to post on the Riley Blake blog in the fall I knew just what I wanted to make: Halloween Pillows!!! In fact, during our renovation last spring when we were shopping for new furniture it may or may not have crossed my mind that gray fabric would be a great choice to match my Halloween Pillows…..wow. I have problems! Truly. 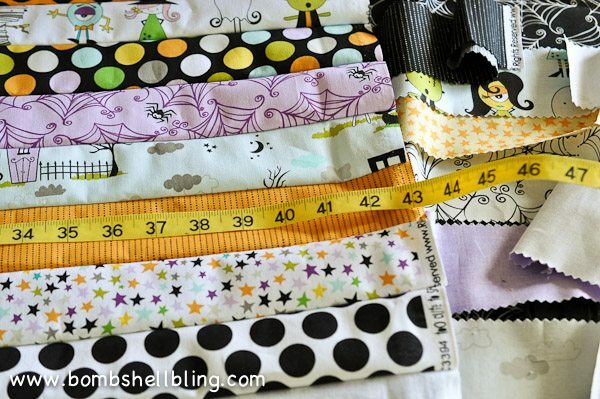 For my project I chose the Too Cute to Spook fabric. It truly IS too cute to spook! I LOVE it! I am a big Halloween lover, but never creepy or super scary things. 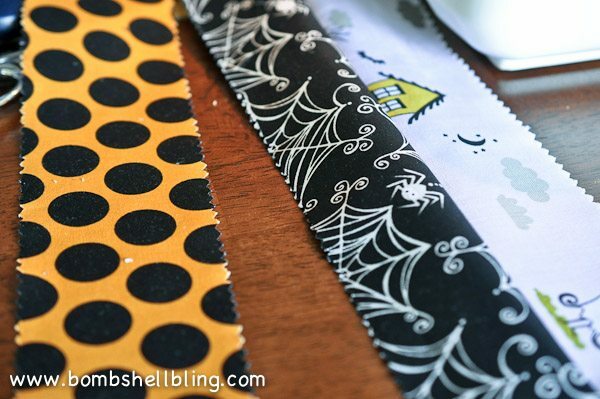 I am a fan of cutesy Halloween, so this fabric is RIGHT up my ally! 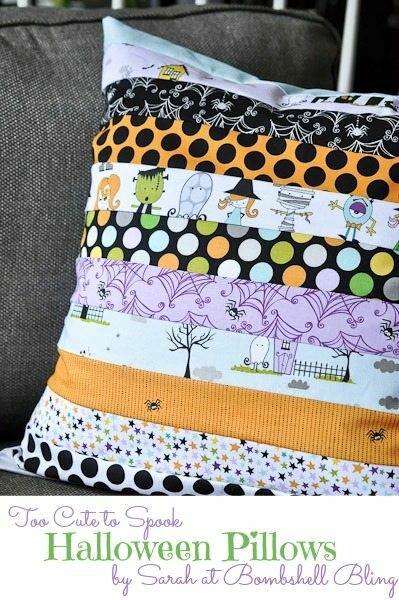 We have some large pillows with removable covers, so I knew that I wanted to make envelope pillow covers that would open in the back so that I could shove the existing inserts into them for October and then easily remove, wash, and store them once Halloween was over. All of my measurement will fit MY pillows. Obviously you will need to adjust yours a bit to fit your own pillows. 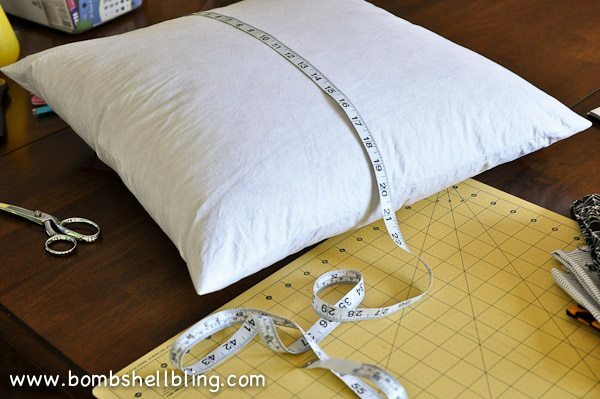 Begin by measuring your pillow. My pillows were 20 inches square. Now add 2 inches or so to that measurement to allow for seams and so forth. This will be the measurement of your front piece. 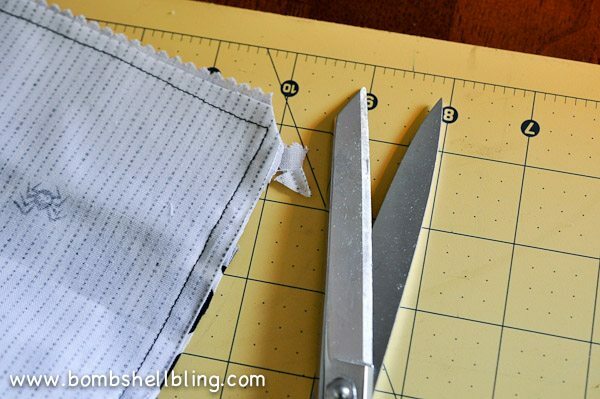 For the back two pieces you should divide your measurement in half and add 3 inches to each piece. These are your two back pieces and they will need to overlap, which is why you added a few inches onto each one. Now it was time to cut. I ended up needing three pieces: a 22 inch square front piece, and two 22 x 14 inch rectangle back pieces. I cut my two back pieces, and I also cut a large square for the more plain pillows that I did (not pictured). However, for the fun striped pillows that I made I only cut the back pieces. The stripes come next! 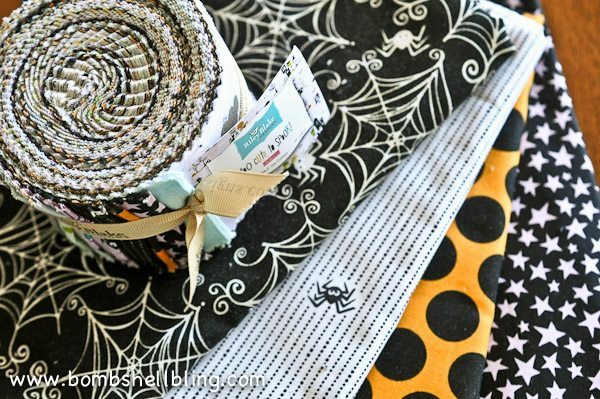 The striped pillows are the reason that I requested a jelly roll of fabric. 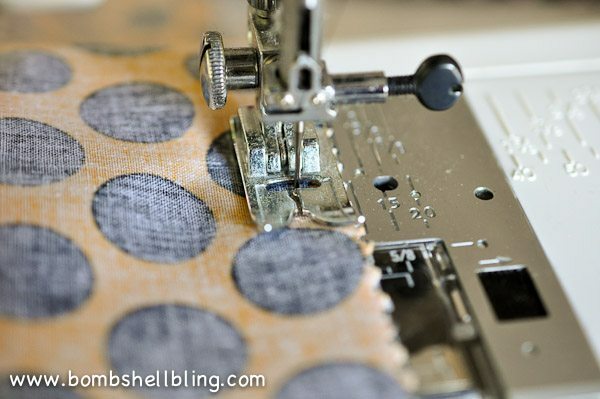 You see, I love fun pillows and projects, but I hate the prep work in sewing. And when I say “hate”……I mean HATE. 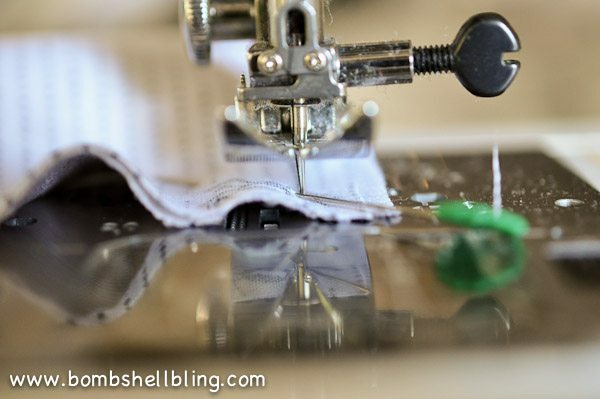 Figuring out measurements and cutting things makes my head spin, which is why I don’t sew as often as I do other crafts. I will never be the fabulous quilter that my mother-in-law is. It just ain’t gonna happen. I hate the cutting. However, thanks to that beautiful jelly roll that you see in the picture above, I didn’t have to! 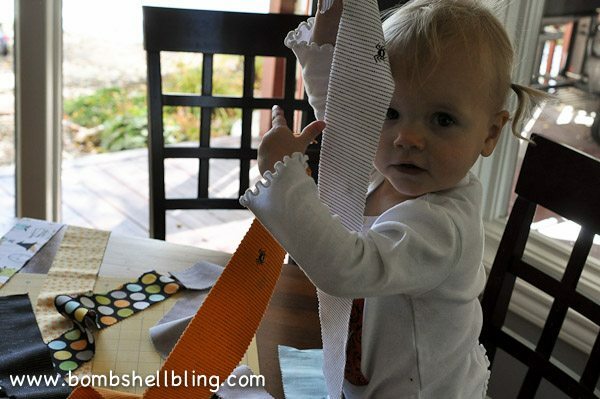 All of the stripes were pre-cut! 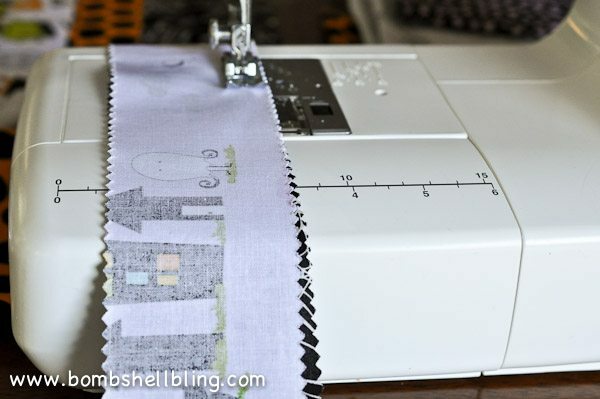 Once your strips are laid out the way that you like them turn the fabric so that it is facing right sides together and sew them together with a small seam allowance so that you don’t lose too much of the print. 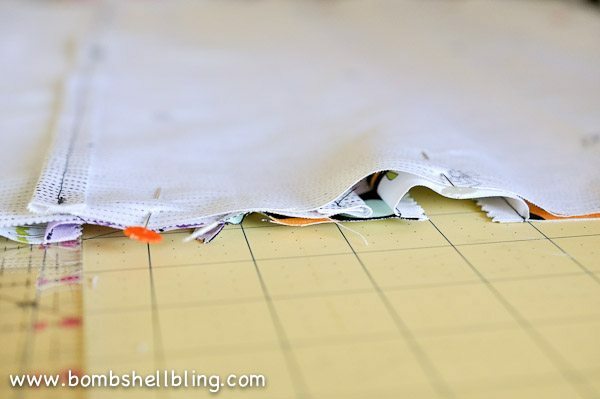 Now open up the two strips that you just sewed together and lay the next strip right sides together on top of the bottom strip. Make sure all of the characters are “standing” the same way so that no one looks like they are upside down on your pillow! Now sew along the new seam. 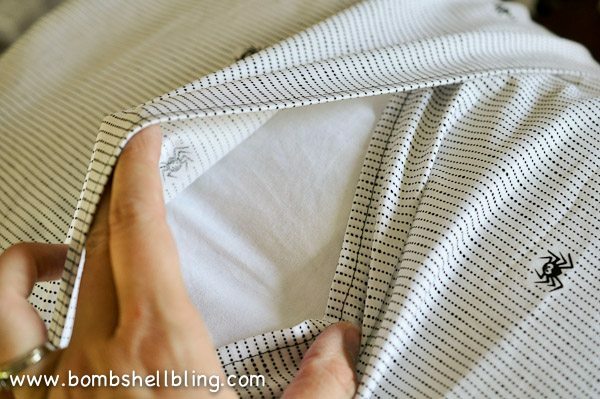 Continue opening and adding strips in this manner until you have a wide enough piece to cover your pillow front. 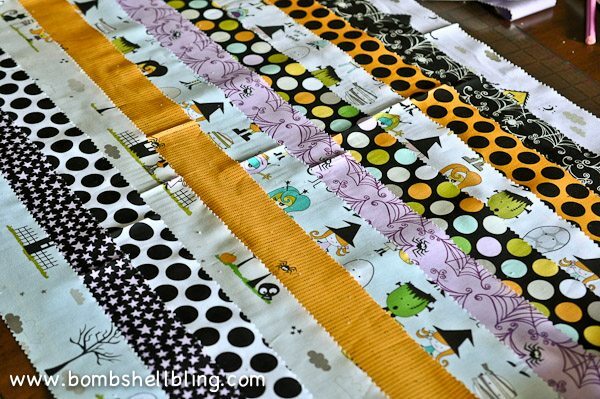 I got really lucky in that the jelly roll strips were the exact width to fold them in half and cut down the middle and VOILA! I had two pillow fronts. Talk about a great surprise! I hadn’t even thought of that possibility until it happened! 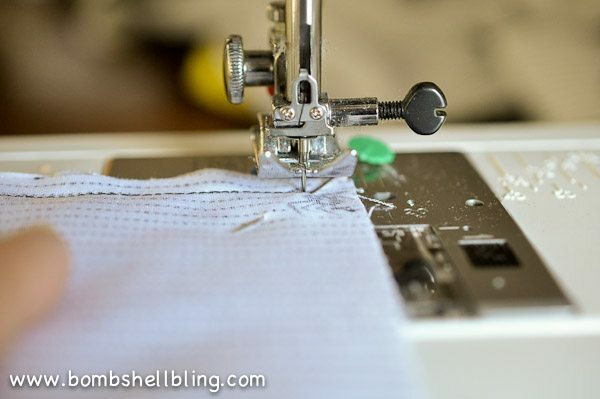 You should now iron your seams flat. They don’t have to be perfect. Just press it enough to flatten the front of your pillow. 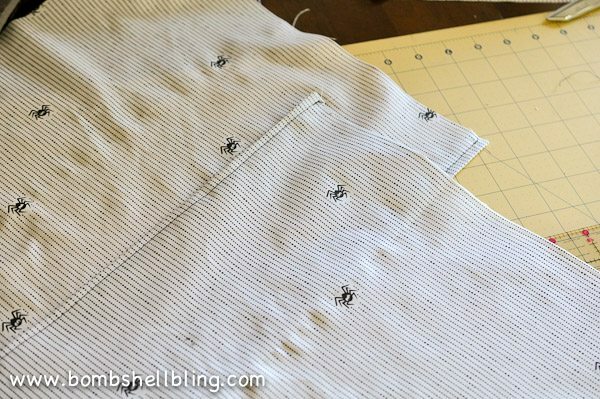 Alrighty, now that your striped pillow fronts are done let’s make the envelope back of the pillows. 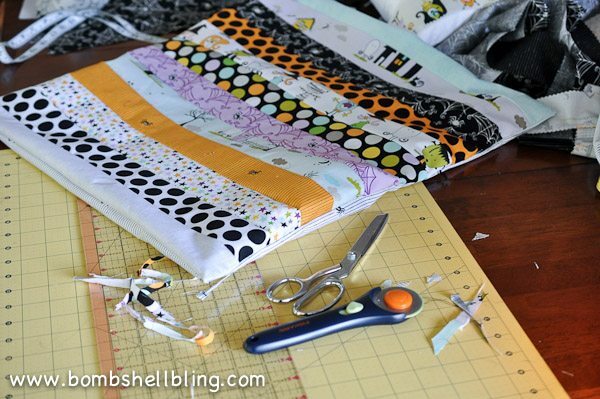 I actually had never made envelope pillows prior to this, and I was delighted by how simple it was! 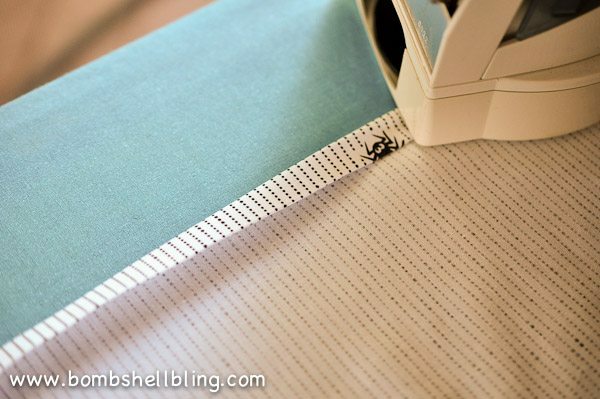 Begin by folding and ironing one of the long edges on of one of the rectangles so that you have a 1/4-1/2 inch hem. Now fold it under again and iron. This will trap the end so that it doesn’t fray when it is washed. 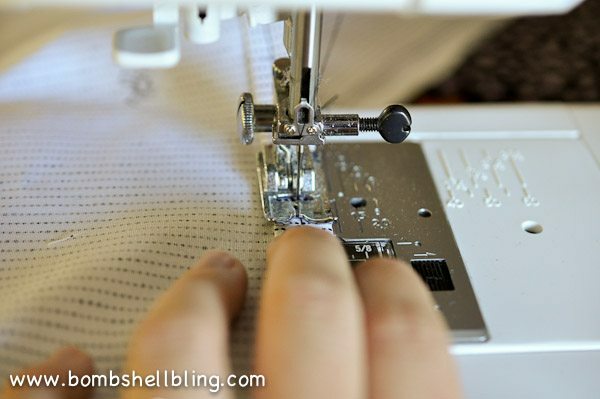 Sew that folded hem into place permanently. Repeat this process with the other rectangle. You now have two finished ends that are ready to overlap, as shown above. Place your striped pillow front face up and place one of the rectangles right side down on top of it. Pin the rectangle in place. Do the same with the other rectangle. You can see in the picture above that they will overlap. You are almost done! 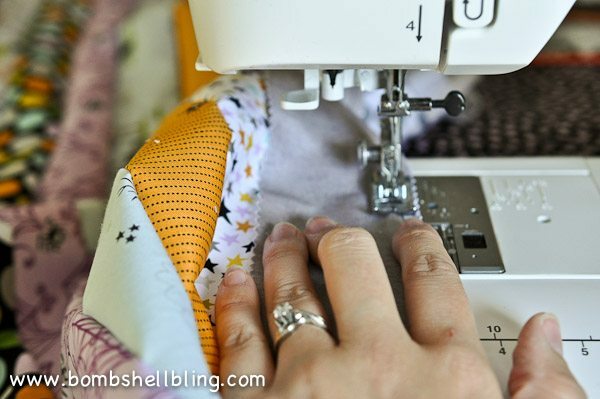 It is time to sew all the way around your pillow cover. 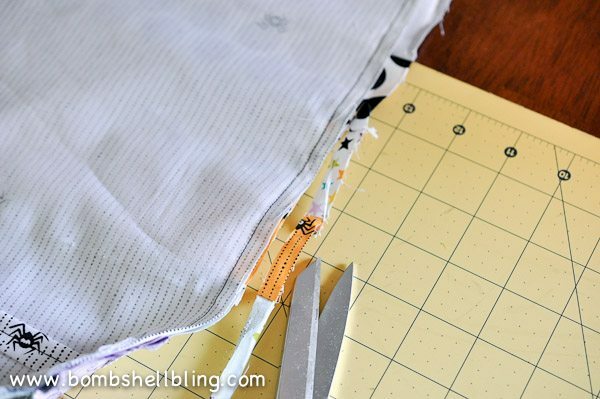 Here is my trick for corners if you are a beginner to sewing. A quilter friend of mine taught it to me years ago. Sew almost to the end. 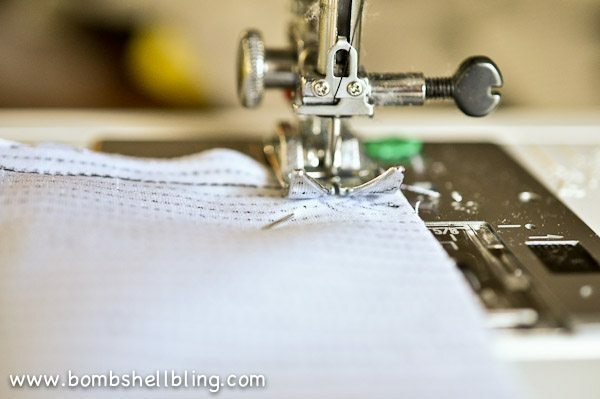 Stop and make sure the needle is DOWN in the fabric. 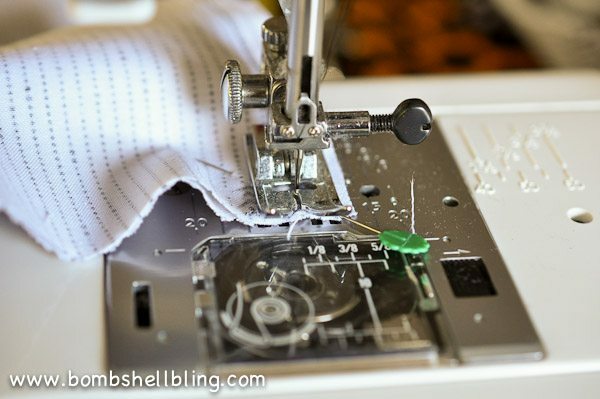 Lift the presser foot, but LEAVE THE NEEDLE DOWN. With the needle still down, turn the fabric 90 degrees. Place the presser foot back down on the fabric. Continue to sew! Easy, right? 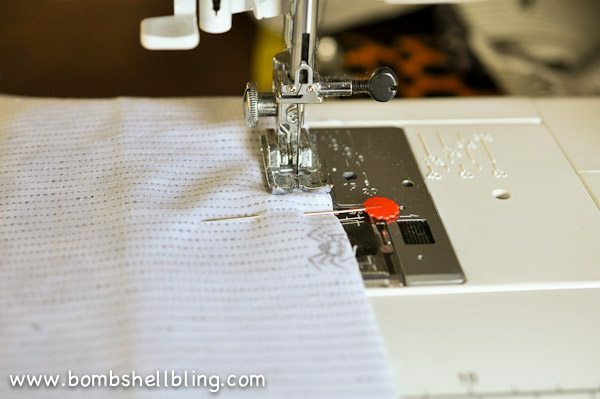 Once you have sewn all the way around the pillow (be sure to backstitch at the start and finish of your sewing!) you can trim the edges a bit if needed. 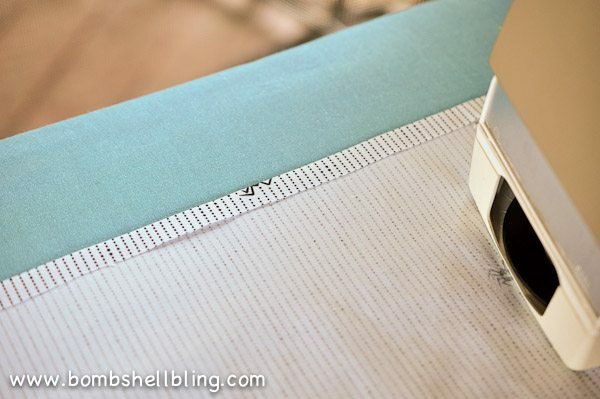 Clip the corners at an angle to make for a sharper point. Now turn the pillow inside out. Doesn’t it look great?! I hope you are proud of yourself! You should be! Now open up that envelope in the back and stuff your pillow inside! I hope you enjoy your pillows all season long! 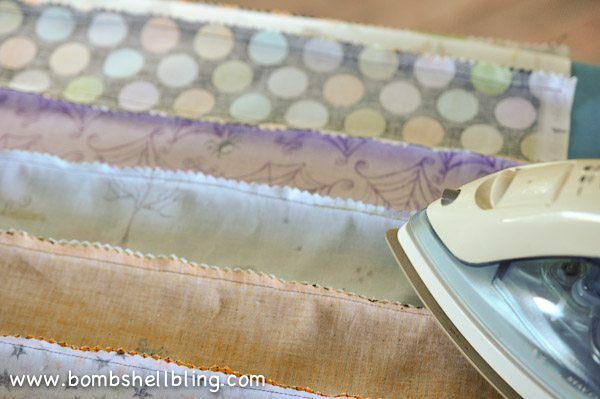 This idea can be used with ANY jelly roll of fabric, so if you like it you can adapt it to any season or style of decor! Mine were 2″ wide. Yours could be a bit different depending on how large your pillow is, but that is what I did.